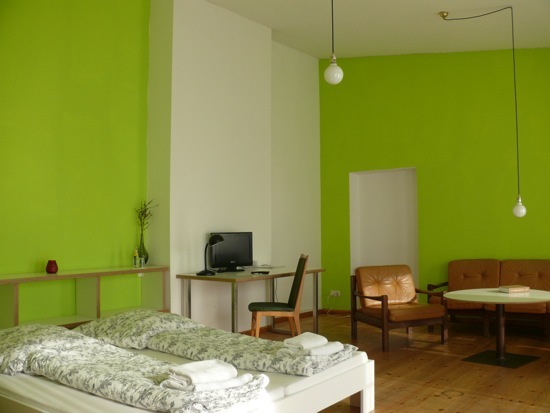 Spend your next longer stay in Berlin in one of the most central, charming and sought after locations – on the legendary Kastanienallee, bordering Berlin-Mitte and Prenzlauer Berg, between culture, lifestyle and nightlife. We offer a selection of four classic Altbau apartments, each fully furnished with stylish contemporary interiors, with very well-equipped kitchen and amenities. Convenience, comfort and good style all in one package. With 103 Bar Restaurant and the W Imbiss on the ground floor of our building, you´ll have an array of choice for delicious meals to satisfy your appetite. Tasty breakfasts, international cuisine and cocktails in a cheerful atmosphere are only a step away. An excellent starting point to explore Berlin, our apartments neighbor the famous Zionskirche, a historically significant heart of Berlin. From here you can take a leisurely stroll to discover the Berliner Mauer Memorial Park and Arkonaplatz Markets, Kollwitzplatz and Hackescher Markt for example - all these destinations are within an easy 15 minute walk. Should you wish to venture further, trams are nearby and operate regularly. Take a 5 minute walk to Rosenthaler Platz U-Bahn, the nearest underground stations, then it’s only 2 stops to Alexanderplatz. We are very happy to announce that we have a new booking system, where you can check the availability of our apartments online, book and confirm your reservation. Enquiries are warmly welcome. We look forward to your visit.